Damaris Ronkanen of Cultura Craft Chocolate gives an acceptance speech as a winner in the Chocolate Category at the Good Food Awards. 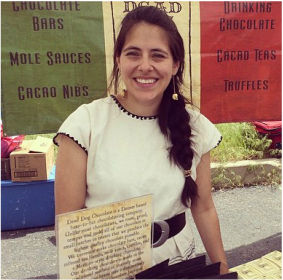 Chocolate has been a part of Damaris’ story in some form or another for most of her life. When she was a kid, she would visit her grandparents in Mexico where her grandma made the best champurrado (chocolate atole) and mole sauce in town. It was dishes like these that made Damaris passionate about food and cooking.